The "S.S. Roger Chaffee," Northrop Grumman's next Cygnus spacecraft to launch to the International Space Station, is christened in honor of the Apollo 1 astronaut, company officials announced on Monday (March 25). "This is the 50th anniversary year of us landing people on the moon on the Apollo 11 mission and when we think of that mission, we think of the thousands of people who sacrificed so much to make that program a success," said Frank DeMauro, the vice president and general manager for space systems at Northrop Grumman, during a Facebook Live broadcast. "But there are three people who paid the ultimate sacrifice for the advancement of moving humans to the moon and they are Ed White, Gus Grissom and Roger Chaffee, the three Apollo 1 astronauts who tragically perished in a fire during a pad test." "Lt. Commander Chaffee never got to fly in space unlike his crew members, yet he was such an inspiration to so many people who followed him in the astronaut corps. And so all of us here at Northrop Grumman, and certainly on the Cygnus program, are honored to name this spacecraft the 'S.S. Roger Chaffee,'" DeMauro said from inside the Cygnus Mission Operations Center in Dulles, Virginia. 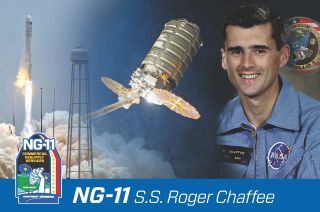 The S.S. Roger Chaffee is scheduled to lift off atop a Northrop Grumman Antares 230 rocket from the Mid-Atlantic Regional Spaceport (MARS) at NASA's Wallops Flight Facility in Virginia on April 17. The uncrewed Cygnus will remain berthed to the station through July, the same month as the 50th anniversary of the Apollo 11 mission, as its cargo is offloaded and it is repacked with refuse for disposal during its destructive re-entry into Earth's atmosphere. The S.S. Roger Chaffee's NG-11 mission will be the first use the Antares rocket's new late load capability, adding payload — including live mice — to the Cygnus spacecraft within 24 hours of the launch. The S.S. Roger Chaffee will also demonstrate the Cygnus spacecraft's capability to remain on orbit after it departs the space station, in support of the ship serving as a scientific research platform on future missions. Northrop Grumman's 11th Cygnus cargo resupply ship, christened the "S.S. Roger Chaffee" in honor of the Apollo 1 astronaut, stands ready for mating to a Northrop Grumman Antares rocket at NASA's Wallops Flight Facility in Virginia. Roger Chaffee, the spacecraft's namesake, was selected with NASA's third group of astronauts in 1963. A Naval aviator who logged more than 2,000 hours in jet aircraft, including flying reconnaissance flights during the Cuban missile crisis, Chaffee worked on flight control communications systems, instrumentation systems and attitude and translation control systems in the Apollo Branch of the Astronaut Office. On March 21, 1966, Chaffee was assigned to the AS-204 mission, also referred to as Apollo 1, the first crewed flight of the Apollo command module. The mission as planned would demonstrate the capabilities of the spacecraft while circling Earth. Less than a month from their scheduled launch, on Jan. 27, 1967, Chaffee, White and Grissom were taking part in a routine "plugs-out" test while strapped into their Apollo 1 command module atop the Saturn IB rocket that would take them to orbit. Tragically, an electrical short ignited the spacecraft's pure oxygen atmosphere and all three astronauts died. Chaffee, 31, was laid to rest at Arlington National Cemetery in Virginia. Since his death, he has been memorialized with a place on the Space Mirror Memorial at the Kennedy Space Center in Florida and with the naming of a planetarium in his hometown of Grand Rapids, Michigan. An artificial island off the coast of Long Beach, California, a crater on the far side of the moon and a hill on Mars also bear his name. The S.S. Roger Chaffee is the first spacecraft to be named in his memory. "From all the people who have been former astronauts and current astronauts, we thank you," said former NASA astronaut Robert Curbeam, the vice president for strategy and business development for Northrop Grumman's space systems division, in reply to the naming of the S.S. Roger Chaffee. "We also thank [the Apollo 1 crew] for their sacrifices because they definitely made spaceflight safer." Northrop Grumman's tradition of naming its cargo vehicles dates back to the first Cygnus launch in 2014, when the spacecraft was introduced by Orbital Sciences Corporation. Orbital Sciences and ATK merged to form Orbital ATK in 2015, which was then acquired by Northrop Grumman in 2018. The most recent Cygnus, which was berthed to the station from November 2018 through February, was named the S.S. John Young after the late Gemini, Apollo and space shuttle astronaut. Other ships were named for astronauts David Low, Gordon Fullerton, Janice Voss, Deke Slayton, Rick Husband, Alan Poindexter, John Glenn and Gene Cernan. The ninth Cygnus, the last to fly before Northrop Grumman's acquisition of Orbital ATK, was named the S.S. J.R. Thompson after the president and chief operating officer of Orbital Sciences. The S.S. Roger Chaffee is the last Cygnus spacecraft to launch under Northrop Grumman's Commercial Resupply Services (CRS) contract with NASA. The company's CRS-2 contract, which provides for at least six more resupply missions carrying an additional 44,000 pounds (20,000 kg) of cargo to the station, will begin with a launch in the fall. Editor's note: A previous version of this story stated that Roger Chaffee flew U-2 reconnaissance missions during the Cuban missile crisis. Chaffee did make such flights, but in a Navy aircraft, not a U-2, which was an Air Force plane. Click through to collectSPACE to see Northrop Grumman's mission patch for the S.S. Roger Chaffee.